These notes describe a compact 2-way loudspeaker system that uses high-quality Vifa drivers. The original system was developed for senior project credit in the Georgia Tech Audio Laboratory in 1990 by an electrical engineering student named Kirk Wrzesien. Kirk's objective was "to design a premium 2-way loudspeaker system for a small dorm stereo system and for use as rear loudspeakers in a home surround sound system". The system uses Vifa drivers in a vented-box enclosure. 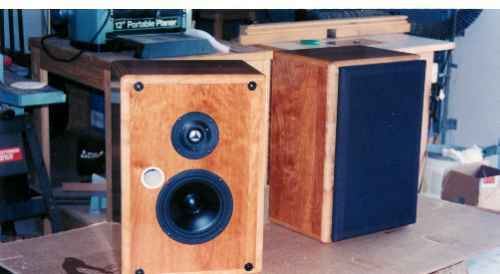 A student assistant who was working for me in 1991 tested a set of the speakers for another student who built them for special problems credit. He was so impressed with the frequency response that he wrote a note on the student's report asking me to please not discard it because he wanted to build a pair, which he did. Kirk's original system used a commercially available enclosure. Its internal volume and Helmholtz resonance frequency were only approximately correct. These plans describe an enclosure that is designed for the Vifa woofer. 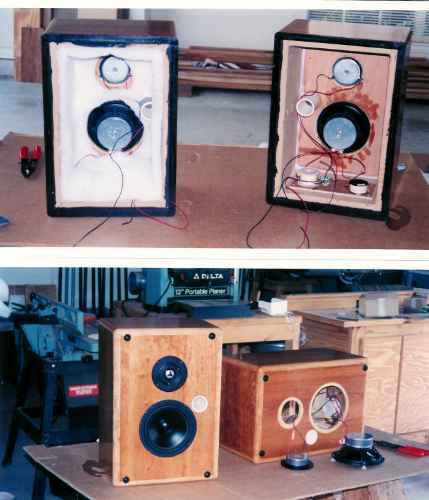 Here are some pictures of the speakers that were built by Dave Anderson: Picture 1 and Picture 2. Dave built two cabinets, inner cabinets of MDF using the dimensions specified in the plans and outer cabnets of cherry plywood. The crossover network is a passive network that consists of a first-order low-pass filter on the woofer and a second-order high-pass filter on the tweeter. The crossover frequency for the tweeter is approximately 3000 Hz. The crossover frequency for the woofer was chosen experimentally for optimum frequency response with the tweeter. A L-pad is used to attenuate the signal to the tweeter by about 4 dB to equalize the on-axis pressure sensitivities of the two drivers. In spring 2001, an ECE faculty member at Georgia Tech built the speakers and considered the sound to be too bright for his taste. He changed the 3 ohm resistor in the crossover network to 4 ohms and the 15 ohm resistor to 8.2 ohms and was pleased with the results. I was reminded of what people long ago called "west coast sound" and "east coast sound." Seems that west coast manufacturers, e.g. JBL and Altec, made loudspeakers with a hot high end. Whereas manufacturers in the New England area, e.g. Acoustic Research and KLH, made loudspeakers with a more muted high end. The two-way speakers described here have a very flat frequency response. But if you prefer something closer to the east coast sound, you might want to use the alternate resistor values. After listening to a set of speakers for a while, nothing can be more annoying if they sound too bright. I recommend the resistor change is you will be sitting close to the speakers. The dimensions for the back panels are reduced by 1/16 inch to keep the fit from being too tight. The pieces should be cut so that the veneer grain matches at the joints between the sides, the top, and the bottom. The grain on the front panel should be oriented along the long dimension of the panel. After the pieces are cut, the edges can be miter cut at a 45 degree angle before they are assembled. Before miter cutting the front panel, the holes for the drivers and the ports should be cut. On each front panel, cut the holes for the tweeter and the woofer so that the two drivers are on a center line with a spacing that separates the outside frames by one panel thickness. Cut the hole for the port so that it is one panel thickness from the outside frame of the woofer and away from the box walls. The lengths of the bracing pieces are reduced by 1/16 inch to prevent too tight a fit. So that the boxes can be opened in case of repair, the back panels are not glued on. To provide an air tight seal for each back panel, the bracing to which it is screwed should be lined with a 1/4 inch thick weather stripping tape. This best tape for this purpose is a closed-cell tape that is sometimes called "camper tape". Two brand name manufacturers are Macklanburg-Duncan Co. and Dennis. Use 3/4 inch wide tape if you can find it. Do not use tape narrower than 1/2 inch. First check to see that the pieces fit together properly before proceeding. Apply wood glue to the edges of one bottom piece and one side piece that are to be joined. Be careful to not get glue on the outside surfaces of the box because it can affect the wood finish. Clamp the bottom and side pieces together with two corner clamps. Wipe off any wood glue that squeezes out from the outside of the joint. Use finishing nails to secure the two pieces together. Repeat the above procedure to attach the other side piece to the bottom piece, then to attach the top piece to both side pieces. Apply wood glue to the edges of the front panel and the edges of the box to which it joins. Install the front panel and secure it with finishing nails. The back panel is not screwed on until after all components are installed. Install the bracing around the back opening. The bracing should be set into the box by 13/16 inch. This is 1/16 inch more that the thickness of the back panel. The additional 1/16 inch is required for the weather stripping between the bracing and the back panel. The bracing should be glued and screwed to the box walls. Drill holes through the bracing for the screws before it is installed. Use 1-1/4 inch wood or drywall screws. After the glue has dried, install the ports in the front panels of the boxes. Use clear, non-paintable silicone-rubber caulk to seal all internal joints, around the port inside the box, and any gaps in the bracing. Do not apply the silicon to the outside surfaces of the bracing where the back panels attach. While the caulk is still soft, use your index finger to smooth it into the joints. Let the caulk set up. Install the closed-cell foam weatherstripping around the back surfaces of the bracing. To prevent air leaks, there should be no gaps in the weatherstripping. Assemble the crossover networks. These can be assembled on a printed circuit board, if one is available, or on a "perf board". Solder the wires to the crossover networks that will later connect to the input cups on the back panels. Secure each crossover network to the bottom of the box. Install the drivers on the front panels. Use machine screws, flat washers, and nuts to secure the drivers. Solder the wires from the drivers to the crossover networks. Staple fiberglass lining on all internal surfaces of the box and on the back panel. The fiberglass should not cover the back of the woofer or the port. It should cover the crossover network. One inch thick fiberglass is recommended for the lining. It can be purchased from Radio Shack (catalog number 42-1082). Use scissors to cut the fiberglass to fit. Cut slots in the fiberglass for the crossover wires. If you cannot find the Radio Shack fiberglass, you can use the kind used for home insulation. But you will have to peel off a thickness of about one inch for the lining. This fiberglass has a paper backing which should be peeled off. Solder the wires from the crossover networks to the input cups on the back panels. Install the back panels and screw them to the bracing. Use at least two screws on each side and at least one screw at each top and bottom. Tighten the screws to compress the foam weatherstripping until each back panel just fits flush with the back edges of the box. Counter sink all finishing nails. Fill the nail-head holes with Elmers Wood Putty. Apply the desired finish to the box. The drivers and crossover network components can be purchased from the Audio Lab of Georgia, 3611 Clearview Place, Atlanta, GA 30340 (770-455-0571). Audio Labs carries some general purpose crossover network circuit boards which can be used with the system. Georgia Tech students usually get a discount at Audio Labs. A good wood working shop which can make the boxes is Wood Wonders, 1200 Foster St., NW, Atlanta, GA (404-355-4778). These people really do a good job at a reasonable price and I recommend them.